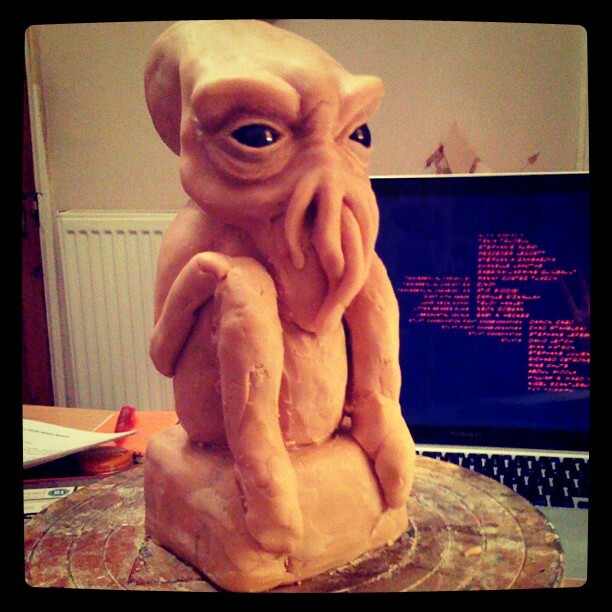 Dave Kirkby has fallen prey to the "Cthulhu Spring" meme and started sculpting an idol of the sleeping god. What makes his effort particularly interesting is that he's documenting the whole process. "My other tools include a number of home made ones, shop bought and some dental tools that a very kind dentist gave to me years ago. I was given about a dozen in total as he said he can only use them for a short time before they have to be replaced so rather than chuck them away he donated them to my worthy cause. As a number of them turned out to be the same I traded a few for bits (students work well on barter systems), some I modified to different shapes by hammering or grinding them while the rest are perfectly good tools that I still have the pleasure to own. Over the years I’ve collected quite a few bits with weird and wonderful (if sharp) edges but there always seems to be a basic few I reach for when starting something."